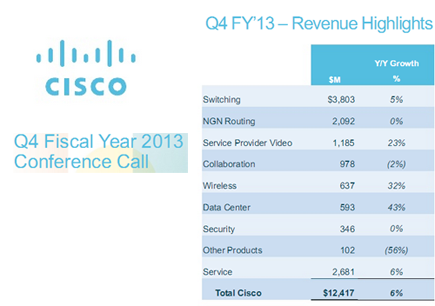 Cisco reported $12.4 billion, net income (GAAP) basis of $2.3 billion or $0.42 per share, and non-GAAP net income of $2.8 billion or $0.52 per share for its fourth fiscal quarter, ended July 27, 2013. Q4 revenue was up 6% year-over-year. "My confidence in our ability to be the #1 IT Company is increasing. Our fourth quarter was a record on many fronts, with record revenue, and record non-GAAP operating income, non-GAAP net income, and non-GAAP earnings per share. In every case, we exceeded the midpoint of our guidance. We also generated $4 billion in operating cash flow in the quarter, another record," stated Cisco Chairman and CEO John Chambers. "Our financial strategy is working as our profits grew faster than revenue for the full fiscal year," stated Frank Calderoni, executive vice president and chief financial officer. "Our fourth quarter also delivered solid financial results as we continued to deliver profitable growth to maximize shareholder value for the long-term." However, Cisco trimmed its guidance saying the economic recovery was uneven, with some regions, notably Europe, performing worse than others. The company now expects growth of 3-5% for the current quarter, compared with the 6% rate just reported. 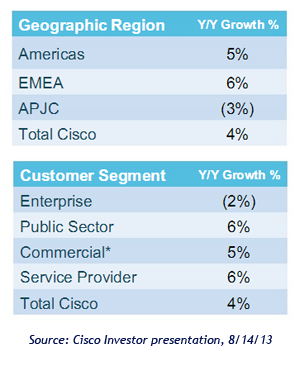 Cisco said it remains committed to its long-term financial model, including driving profitable revenue growth of 5-7%. Cisco plans to cut about 4,000 jobs or about 5% of its workforce as a result. 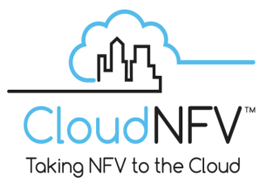 A new, CloudNFV vendor group has been established with the goal of developing a prototype based on the ETSI Network Functions Virtualization (NFV) Industry Specifications Group (ISG) work. CloudNFV, which was set-up by CIMI Corporation President Tom Nolle, has just released a technical framework and public demonstration schedule of an open platform for implementing NFV based on cloud computing and Software Defined Networking (SDN) technologies in a multi-vendor environment. The objective is to structure software and hardware elements, select practical interfaces and data models, and adapt as needed through the evolution of the ISG NFV specification. The group is planning a series of webinars beginning in late September and will include live, in-person demonstrations conducted at various industry events through the end of the year. Founding members include 6WIND, Dell, EnterpriseWeb, Overture and Qosmos. Infinera and DANTE (Delivery of Advanced Network Technology to Europe), have set a Guinness World Record for the fastest rate of multi-Terabit optical capacity provisioning across the GÉANT Network. Infinera and DANTE were able to install and activate eight Terabits per second (Tbps) of long haul super-channel optical capacity. 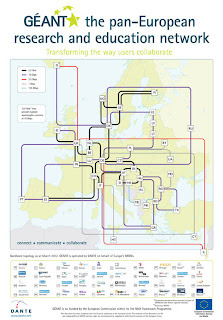 The record was set using an Infinera Intelligent Transport Network, featuring the DTN-X packet optical transport networking platform, deployed on the GÉANT backbone across a long distance link from Vancis Amsterdam, The Netherlands to GlobalConnect Hamburg, Germany. 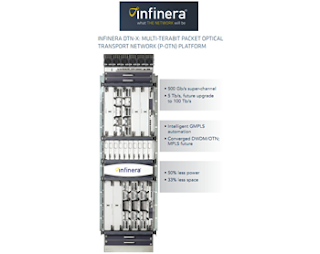 The DTN-X platform features 500 Gbps super-channel line cards which require only two fiber connectors each. Sixteen such cards and 32 fiber connections were deployed at each end of the link, and once the super-channels were in operation a 100 Gigabit Ethernet service was provisioned over the link. The total time from the insertion of the first super-channel line card to the activation of the 100 GbE service was 19 minutes and 1 second resulting in a provisioning rate of 26.02 Tbps per hour. Infinera said the record underscores how an Intelligent Transport Network enables service providers to use the rapid provisioning time to increase revenues with reliable, differentiated services while reducing operating costs through scale, multi-layer convergence and automation. Tele2 AB and T-Mobile Netherlands announced a network sharing agreement that provides Tele2 Netherlands with access to T-Mobile’s sites. The deal gives Tele2 Netherlands access to the majority of antenna sites on rooftops and towers, in addition to its own sites in the Netherlands. Both operators will however roll out and operate their own frequencies and nationwide mobile communication network independently. Both T-Mobile and Tele2 will be installing their own network equipment at each site, but will share the antennas on rooftops or towers and the installment of other non-intelligent hardware. 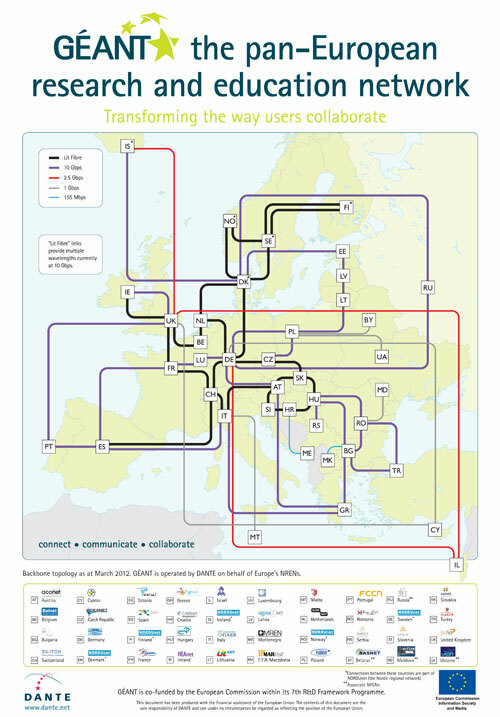 In addition, Tele2 has extended the MVNO agreement for 2G and 3G with T-Mobile Netherlands for a period of 5 years. The companies said the agreement ensures lower maintenance costs of the physical mobile network. The extended MVNO agreement ensures continued use of voice and data services for Tele2’s customers. It also serves as a fallback solution after the completion of Tele2’s own 4G network roll-out. Equinix has appointed Charles Meyers, formerly President of the Americas for Equinix, to the newly created role of Chief Operating Officer (COO). The company said the addition of the COO function is part of a reorganization designed to align the company globally to best serve the needs of Equinix customers. The Global Sales, Marketing, Operations and Client Services functions will now report directly to Meyers. SanDisk introduced enhanced versions of its solid state drive (SSD) line-up for businesses that prioritize fast, consistent access to data, such as search engine and cloud storage providers and streaming media companies. The SanDisk X210 SSD provides up to 512GB of storage and offers up to 505 MB/sec sequential read and up to 470 MB/sec sequential write speeds. It features automated power management and is built on SanDisk’s advanced 19 nanometer (nm) manufacturing process technology. 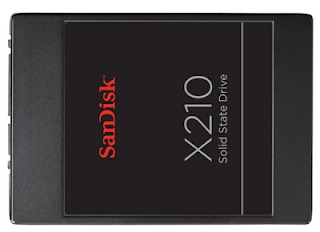 "Since launching SanDisk’s commercial SSD channel earlier this year, we have received a tremendous response from businesses that have seen significant advantages from incorporating SanDisk solid-state technology into their data center and workplace PCs and notebooks," said Tarun Loomba, vice president of Storage Solutions marketing at SanDisk. Samsung Electronics introduced its first solid state drive (SSD) based on its 3D V-NAND technology. The new SSD, which designed for use in enterprise servers and data centers, comes in 960 gigabyte (GB) and 480GB versions. The 960GB version boasts the highest level of performance, offering more than 20 percent increase in sequential and random write speeds by utilizing 64 dies of MLC 3D V-NAND flash, each offering 128 gigabits (Gb) of storage, with a six-gigabit-per-second SATA interface controller. The new V-NAND SSD also offers 35K program erase cycles and is available in a 2.5 inch form factor. Samsung began producing its new V-NAND SSDs earlier this month. "By applying our 3D V-NAND – which has overcome the formidable hurdle of scaling beyond the 10-nanometer (nm) class, Samsung is providing its global customers with high density and exceptional reliability, as well as an over 20 percent performance increase and an over 40 percent improvement in power consumption," said E.S. Jung, executive vice president, semiconductor R&D center at Samsung Electronics. 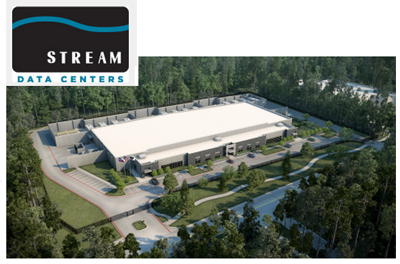 Stream Data Centers has opened a newly constructed 74,901-square-foot data center in The Woodlands, a suburb north of Houston. A multinational corporation has leased one of the three available Private Data Center Suites at the property and has outsourced its mission-critical IT infrastructure operations to Stream. The Stream Private Data Center provides tenants with customizable maintenance and operations programs for their own infrastructure within a dedicated, fully independent Private Data Center Suite. Each PDC Suite has independent power and cooling infrastructure, delivering 1,125 KW of 2N critical load expandable to 2,250 KW across 10,000 square feet of raised floor data center space. The new data center is built with a 2N electrical / N+1 mechanical configuration, delivering dual feed power from separate substations. The carrier-neutral facility has access to eight fiber providers through diverse, private fiber conduits, and offers seven days of onsite fuel storage. Stream Data Centers also has enterprise quality data center facilities in Dallas, San Antonio, Denver and Minneapolis. Since 1999, Stream has acquired and developed more than 1.3 million square feet of data center space, representing over 120 megawatts of power. Narus, a leader in big data analytics for cybersecurity, appointed Mohan Sadashiva as senior vice president of product management. Sadashiva most recently served as vice president and general manager of the cloud services broker business unit at Intel Corporation, through the acquisition of Aepona. Prior to Intel, Sadashiva was the senior vice president of marketing at Synchronoss, where he managed marketing, business development, products and the patent portfolio. His experience also includes serving as vice president of products at Trimble, where he was responsible for a $100 million on-demand field force solution. Sadashiva has held leadership positions at Openwave Systems, Schlumberger and Nortel.